While these events may have already come and gone, we wanted to leave them on the website as evidence of how our programming is implemented and to encourage further learning! If you see something that interests you or sparks a question, send us a message! Check out our “Learning Links & Resources” page for helpful information that was presented/given at these events! Grace Seeds invites you to “Seeds, Stories and Soup,” an intergenerational event, at Bethlehem Evangelical Lutheran Church (9401 S. Oakley) in Chicago on March 15, 10:30 am-12:30 pm. Parents and grandparents are invited to bring their children and grandchildren for a shared time of seed planting, story telling, and story-making. The reality: climate change is happening now. Scientists have shown us the evidence. Gardeners see it happening in their own backyards. With these global climate shifts, come serious economic, political, environmental and social challenges. How can our faith help us to meet these challenges? How can we take what we say we believe and turn those beliefs into a faith-filled response? Join us on March 22 for a presentation on the impacts of climate change, presented by The Climate Reality Project. After the presentation, we’ll hear from an interfaith panel: highlighting the ways different faith traditions understand our place in God’s creation and our responsibility toward it. We’ll ask how that faith inspires action and we’ll explore some action we can take together to help the planet we call home! We’ll end with a savory, simple soup lunch and an opportunity to continue sharing and networking at the table! An RSVP isn’t required, but it would be helpful to know if you’re coming – so we have enough soup! To RSVP, please email graceseedsministry@gmail.com or call 773-495-7865. For more information about Grace Seeds Ministry, visit their website: https://graceseedsministry.wordpress.com. Come celebrate the beginning of a new season of Share the Harvest by having fun with fungi! We’ll learn the important role fungi play in our ecosystem and we’ll learn how to grow fabulous, delicious, healthy mushrooms! 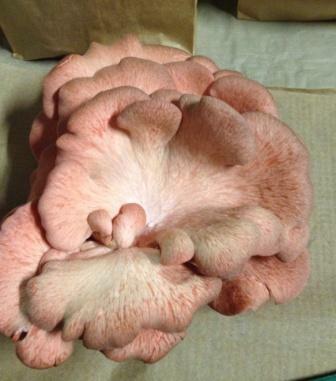 Our guest presenter and teacher for the morning will be Rachel Swenie, who will also lead us in a hands-on opportunity to prepare “spawn” we can take home to get started with our own mushroom growing! Also included in the morning: opportunities to learn fun ways to recycle your magazines and newspapers and get recipes for eco-friendly personal care/cleaning items! And…(drum roll)…we’ll be unveiling the new Grace Seeds Ministry logo, created by graphic artist Megan Schreurs! Megan, one of Clarissa’s YAV colleagues here in Chicago, generously donated her artistic gifts to create the logo! Come celebrate our new “look” and stay for a delicious lunch!